If you have fear about heights, this escalator might not be good for you. This is the highest escalator I had ever seen..It is in Universal Studio-Hollywood in California...There are always lots of people visiting the famous movie settings in US Hollywood!! 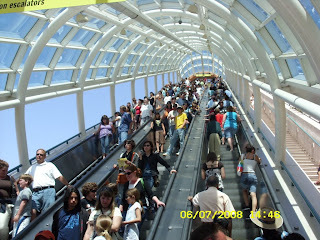 see how many people go down and up in this escalator!!! wish everyone a nice day!! take care! !